In a textbook display of political opportunism, Miliband has seized on the perception that the Tories in the current coalition government were binding the hands of local councils in their fight against the bet shop/FOBT dastardly duo. 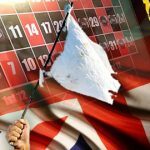 Existing law allows betting firms to move into any vacant premise that used to be a bank, building society, estate agent, employment agency and the like, but Milliband vowed to reclassify betting shops to allow local councils more control over what goes where. 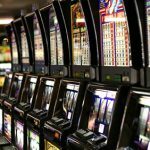 Miliband said a Labour government would amend the Gambling Act 2005 to allow councils to reduce the number of FOBTs allowed in existing betting shops, which is currently set at a maximum of four. 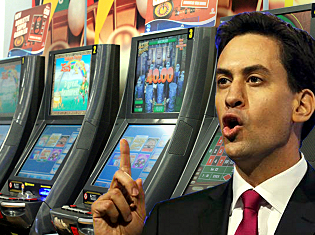 Labour would also require FOBTs to be reconfigured to include pop-ups indicating how much money bettors had spent during their present session as well as mandatory time-outs to snap gamblers out of the apparent zombie-like state Miliband believes they adopt once they press that first FOBT button and ride the elevator down to gambling hell. 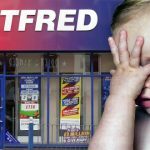 The claim of bettors losing £18k per hour to FOBTs is based on the expectation that every single one of the 180 possible spins per hour results in a total loss of the sum wagered, a prospect the UK Gambling Commission called “astronomically improbable and cannot be credibly cited.” The FOBTs have a designated 97% rate of return, far higher than the 70%-80% ratio on traditional ‘fruit’ machines or the 50% payout one can expect from the National Lottery, the UK’s most popular form of gambling. This fuzzy math was taken to task in a paper released this April by the Institute of Economic Affairs’ Chris Snowdon, who chastised media outlets for headlines claiming that punters in a particular region – say, Scotland – were blowing £4b a year on FOBTs, forgetting that the actual take from these machines amounted to a little over £120m, reflecting a 3% hold in keeping with their designated payout ratio. Snowdown suggested the same stats would allow headlines saying Scots punters had won £3.9b playing FOBTs. Both claims are technically true and equally disingenuous. 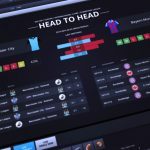 As for those betting shops breeding like bunnies, Snowdon’s research revealed that the number of betting shops in the UK has actually fallen from its late-1960s peak of around 16k to a record low of 8,732 in 2000, rising a modest 4.5% since then to 9,128 in 2012, making for a rather benign ‘epidemic.’ As for accusations of bookmakers ‘clustering’ these shops, Snowdon notes that the four main bookies – William Hill, Ladbrokes, Gala Coral and Betfred – “are naturally attracted to areas where there is known demand, high footfall and low rents.” Given that a 2013 report by the Center for Retail Research estimated one in eight UK high street shops was already vacant and one in five were likely to close within the next five years, bookmakers are simply filling a void, for which local councils should be grateful, not resentful. 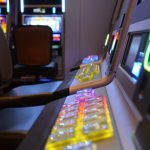 Snowdon also noted that while betting shop’s FOBT revenue may be on the rise, OTC betting is falling, leading to a net reduction in the total amount wagered via the shops. So it’s not like the FOBTs are taking additional money out of the market; more like consumers are choosing to spend their betting dollar in different ways. Bottom line: don’t believe the anti-FOBT hype.